In 1951 in Milan, together with Dangelo and Dova, Baj founded the "Nuclear Art" movement; in 1954, in opposition to the systematic repetitiveness of stylistic formalism, along with Asgern Jorn he founded the "Mouvement International pour une Bauhaus Imaginiste” against the enforced rationalization and geometric abstraction of art. Baj's work is divided into various periods, all marked by profane irony and a constant pursuit of renewed form of expression: playful, fun themes like those in "Mirrors, furniture, meccano constructions, ladies, modifications, d’apres (Gli specchi, i mobili, i meccani, le dame, le modificazioni, i d’apres" become part and parcel of a denouncement of violence and decline. From the very first representations of the nuclear period (1951) he showed a commitment to fighting all forms of aggression which, through the grotesque collages entitled “Generals (Generali 1959)” and "Military parades (Le parate militari)", led to three great works: "The funeral of the anarchist Pinelli (I funerali dell’anarchico Pinelli 1972)", "Nixon parade" (1974) and "The Apocalypse (L’Apocalisse 1979)". With "Epater le robot" (1983) and "Mannequins (Manichini 1984-87)" Baj stepped up criticism of contemporary society and the indiscriminate use of technology, while with "Metamorphosis and metaphors (Metamorfosi e metafore 1988)", "Mythology of Kitsch (Mitologia del Kitsch 1989)" and "Garden of delights (Il giardino delle delizie)" he denounced the corruption of taste brought about by the culture of industrial products. In 1993 he began the series of "Tribal masks (Maschere tribali)", "Felts (Feltri)" and "Totems (Totem)". In 1999 he created 164 portraits of the Guermantes from Proust's Remembrance of Things Past. A restless artist and intellectual, Baj constantly wove together his creative work with intellectual reflections on art. Midway through the Fifties, he contributed to the magazines "Il Gesto" and "Phases". 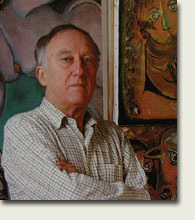 He published numerous books, including “Patafisica”, “Automitobiografia”, ”Impariamo la pittura”, “Fantasia e realtà” with publishing company Guttuso, “Ecologia dell'arte”. He wrote, particularly during the Eighties, for major newspapers and magazines, including “Il sole 24 ore” and “Corriere della sera”.